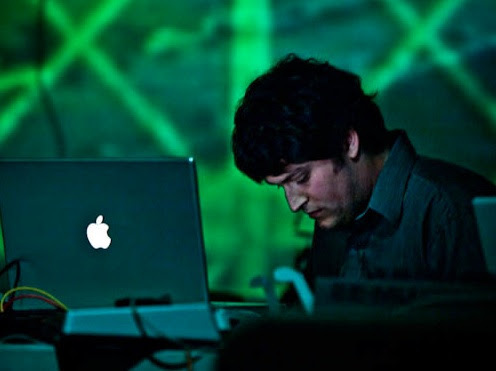 Sam Pluta is a New York City-based composer, improviser, and sound artist specializing in the use of the laptop as a performance instrument. As a composer, Pluta combines electronic soundscapes with acoustic instruments in compositions ranging from solo instrumental works to pieces for ensemble with electronics to compositions for large ensemble and orchestra. He has written for numerous ensembles including Wet Ink, Yarn/Wire, Mivos Quartet, and International Contemporary Ensemble, and he has recently received commissions from the Lucern Festival, the Fromm Foundation, the Barlow Endowment, and Arts Brookfield. He is a member of multiple composition and improvisation-based ensembles, including a longstanding collaborative history with both Wet Ink Ensemble and the Peter Evans Quintet. He has toured Europe and the U.S. with these various groups and performed at major festivals and venues, such as the Lucerne Festival in Switzerland, the Moers and Donaueshingen Festivals in Germany, Bimhuis in Amsterdam, and The Vortex in London.